Russia’s Deputy Prime Minister Maxim Akimov and a delegation of Russian businessman conveyed a strong message of “business as usual” in Jerusalem on Tuesday, less than a month after Syrian forces responding to an Israeli airstrike mistakenly shot down a Russian military reconnaissance plane, killing all 15 crew members on board and igniting tensions between Russia and Israel. Blaming Israel for the incident, Russia recently delivered the S-300 anti-aircraft system to Syria which Israel and the US fear could complicate ongoing Israeli efforts to prevent Iran from deepening its military presence in Syria and transferring weapons to the Lebanon-based terror organization, Hezbollah. Akimov said the two countries were already cooperating successfully in areas such as health care, industry, and pensions for elderly Russian immigrants in Israel, and that had “brilliant expectations” from and saw a “brilliant future” for the bilateral partnership. He cited Hadassah Hospital’s diagnostic center at Moscow’s International Medical Cluster in Skolkovo as an example of that cooperation. 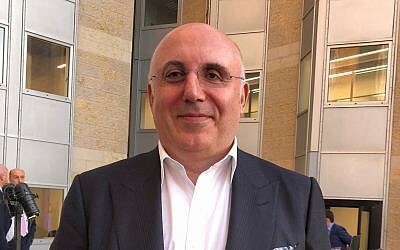 Temur Ben-Yehuda (Khikhinashvili), a prominent Georgian-born, Moscow-based Russian-Israeli Jewish businessman, told the Times of Israel via a translator that while he could not comment on political issues, he hoped that the positive relationship between the two countries as reflected in growing trade figures would triumph over any “negative tendencies” of recent weeks. He said Russian trade with Israel reached $1.8 billion from January to August this year — a rise of 11 percent over the same period last year. The event took place at the end of the two-day 15th joint Russian-Israel intergovernmental committee of economic cooperation during which Akimov met with Prime Minister Benjamin Netanyahu to discuss collaboration in various fields. He said that Akimov and Elkin returned to the foreign affairs ministry “in a very good mood” after meeting with the Israeli prime minister, following “a very good meeting” in which they discussed opportunities for business cooperation in areas such as high-tech, agriculture, medical tourism to Israel, and tourism in general. 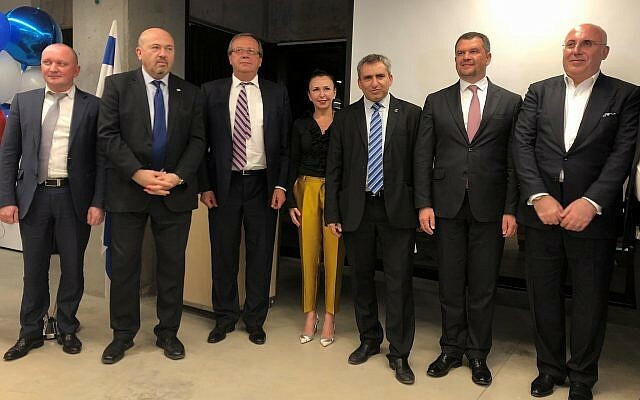 The new Israel-Russia Chamber of Commerce — launched at the Biohouse, a hub for biomedical researchers on the capital’s Hadassah Hospital, Ein Karem campus — brought together health ministry officials and business people from both countries who are interested in cooperating on medical digitalization. Israeli companies exhibited products as varied as computer programs for digital sequencing of genetics, a monitoring system for the elderly, and medical cannabis solutions. The chamber of commerce forms the Israeli side of a partnership with the Russia-based Israel-Russia Business Council, which was set up several years ago. Ben-Yehuda heads the latter and will serve as president of the former. Lawyer Anna Moshe is chairman and CEO of the new chamber of commerce.